Home PowerShell SharePoint Online SharePoint Online: How to Change Site Owner using PowerShell? How to Change Site Owner in SharePoint Online? Important: You must be either Global Administrator or SharePoint Online Administrator to change site owners in SharePoint Online! Sign in to Office 365 Admin Center (https://portal.office.com/), Click on "SharePoint Admin Center" link from "Admin Centers" section. You'll be landing to Site Collections list in SharePoint Admin center (https://YourDomain-admin.sharepoint.com/_layouts/15/online/SiteCollections.aspx) with all site collections listed. 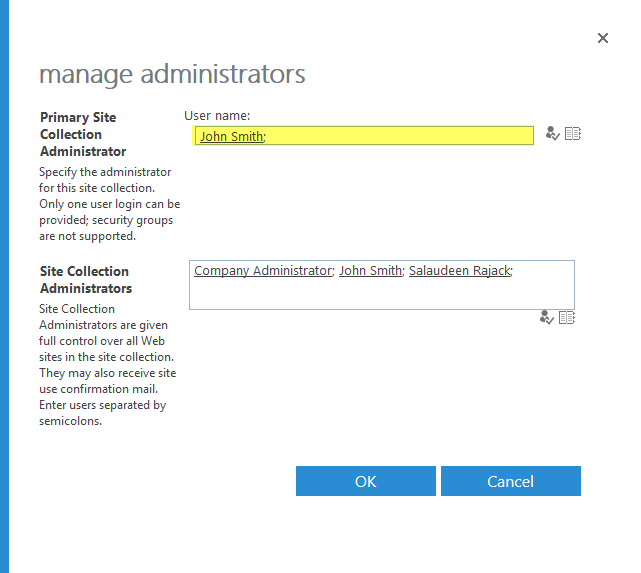 Select the site collection from the list of site collections to which you want to change the site owner >> From the ribbon, Click on "Owners" and then "Manage Administrators"
On the "Manage Administrators" dialog box, You can change the primary site collection administrator - Site owner. You can also configure additional site collection administrators. Enter the name for primary site collection administrator and Click OK save your changes. You can add only ONE site owner (Primary Site Collection Admin) in SharePoint Online! There is no secondary admin in SharePoint Online, but you can add more than one "Site collection Administrators". We can change the site owner using Set-SPOSite cmdlet. Here is an example: Set the variables according to your environment.